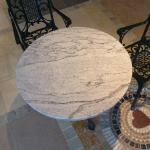 We supply indoor and outdoor table tops from our own range of designs and we also custom make to order. 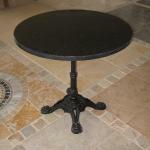 Bases are available made from stone, wrought iron and stainless steel. The tops shown on this page are a selection from the range that we have been producing. Please ask for a quotation. 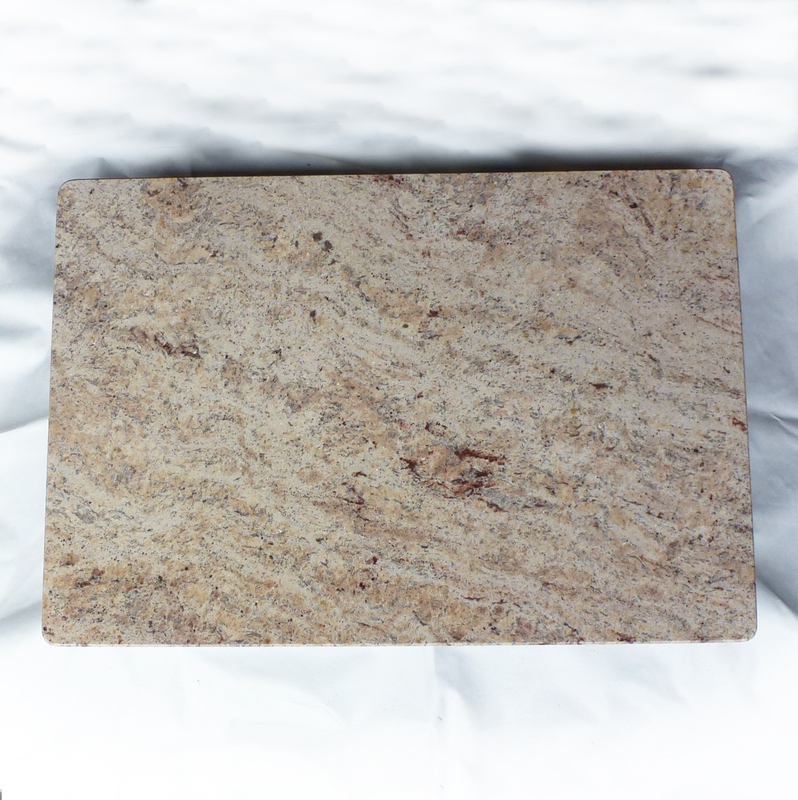 If we have the material in stock, the price will be competitive. 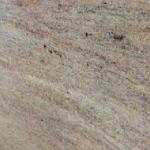 But, if we have to order in the material, the price may include the cost of a whole slab. 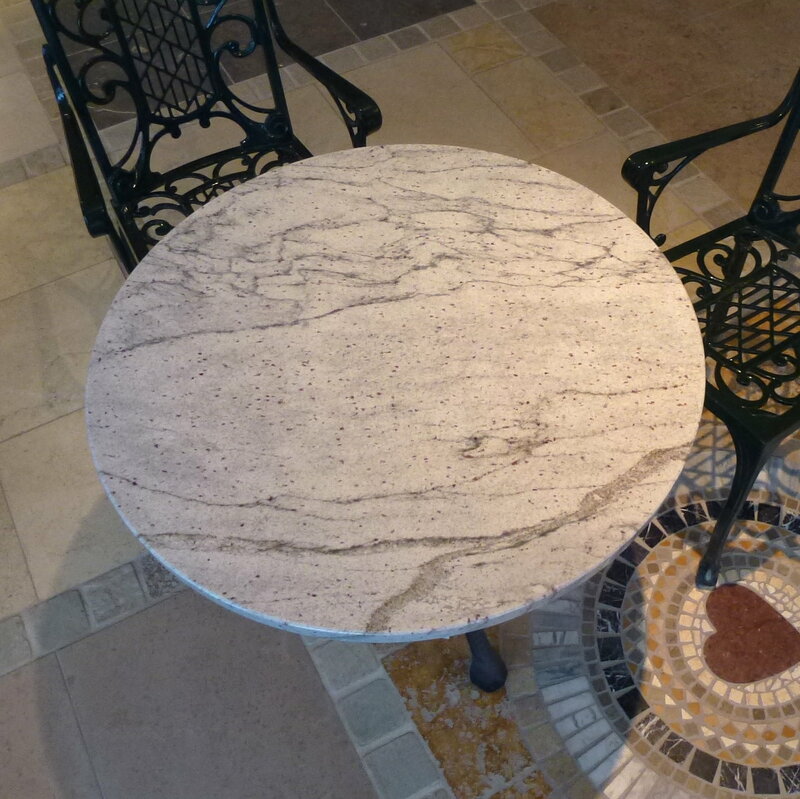 Not all of our table tops are shown below, so please call us to find out what else is available. Unless specified otherwise, the prices quoted below are for the table tops only. 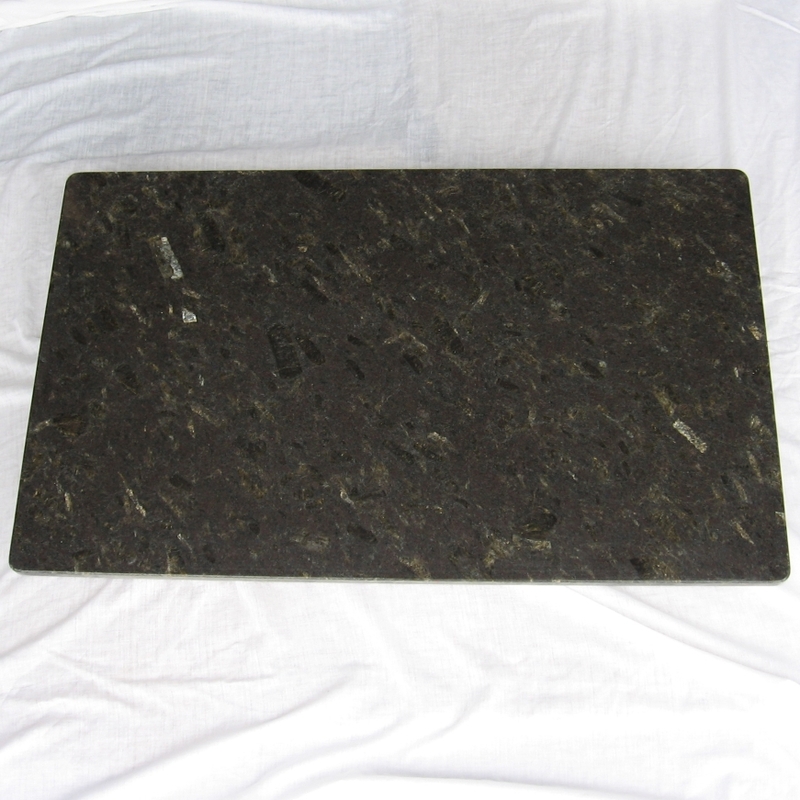 Table tops made from a black granite with a hint of green and a fine crystalline texture suitable for inside and outside use. We have two 800mm and three 600mm tops in stock. These have a bevelled edge. A one off 700mm diameter 30mm thick Titanium Granite top mounted on an ornate cast iron base. Titanium is a stunning Brazilian black granite with white, grey and gold coloured swirling veins.This table is now sold, but please enquire about the availability of material in stock to make more. 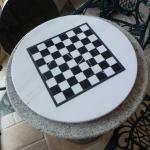 Coffee Tables made to order. 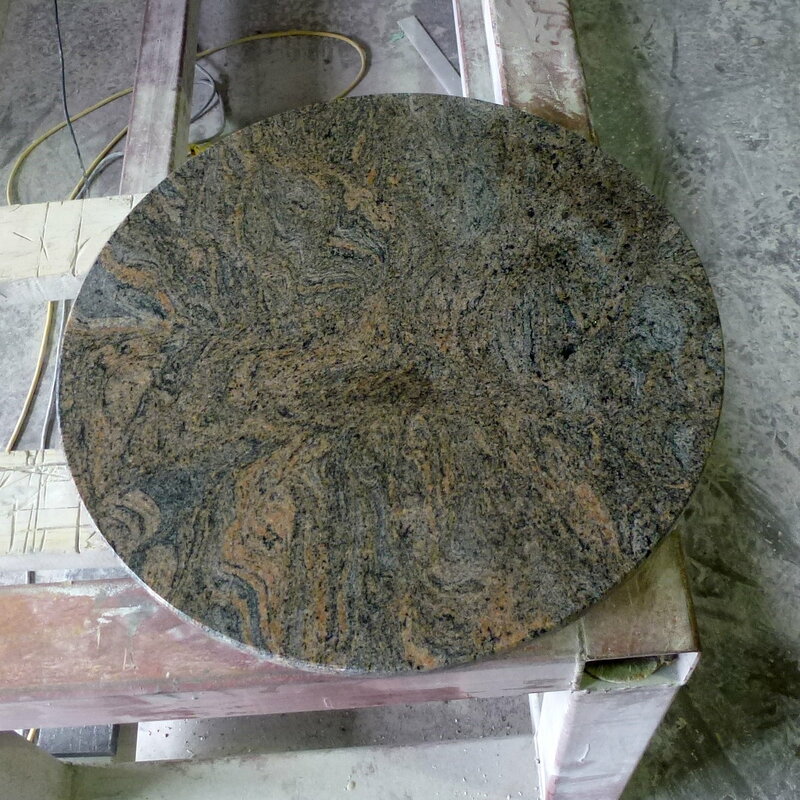 The picture is of a complete table made from Celestial Brown Granite. 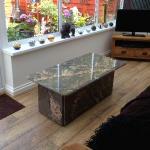 The base is made from MDF with a hardwood frame clad with granite to match the top. 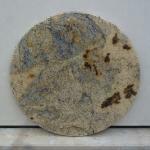 Volga blue granite comes from the Ukraine. 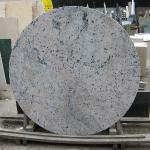 It consists of a mainly grey/black mottled background with randomly scattered beautiful blue and white crystals. The granite is suitable for outdoor use, and the table illustrated will seat 7 people comfortably. 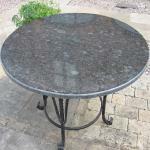 The two tables in stock are being sold at a discounted price, so please ring for prices if other sizes are required. 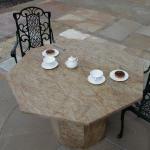 Table tops made from a golden brown granite suitable for inside use and occasional outside use. We currently have one 600mm diameter top in stock. 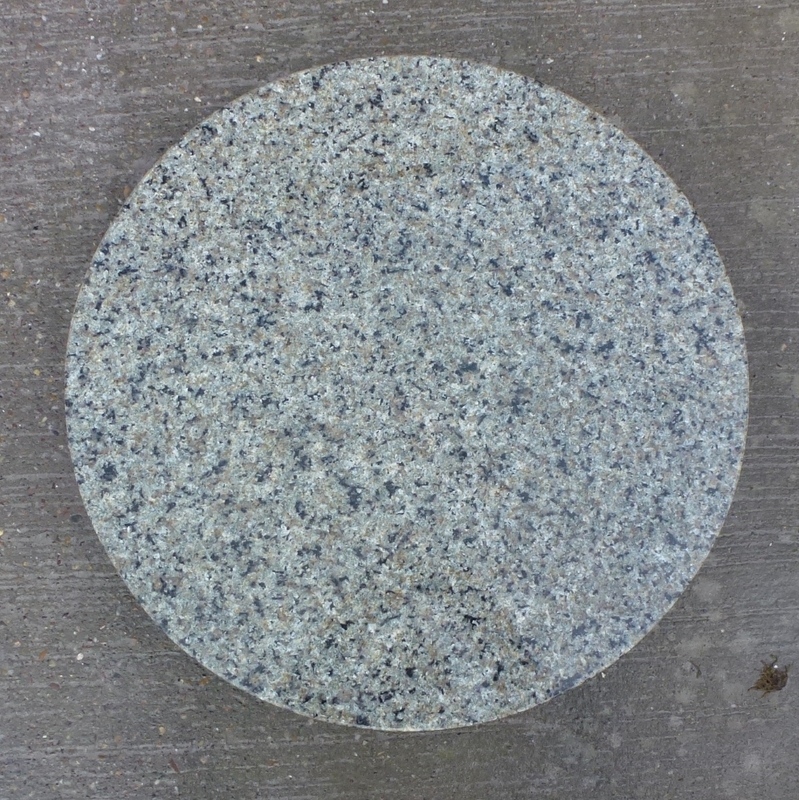 Steel grey is a mid grey granite with a coarse speckle of pearlescent crystals. It is suitable for indoors and out. Other table top sizes can be made to order from material in stock. 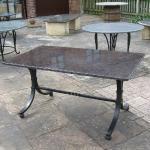 There is a table on display at Ironbridge Antique Centre, consisting of a Steel Grey top mounted on an ornate cast iron pedestal base. We have made two 500 x 500 x 520mm Carrara marble cube side tables. Ideal for lamp tables that will double up as occasional seats. These are a one-off that we have made, but can make more. The construction of these is 30mm Carrara cladding an MDF carcass. They have four adjustable feet. Blue Pearl is a fabulous material for table tops. A top with a bit of wow. Full bull nose edge detail. We have a 650mm diameter table top in stock, but we have the granite to make different sizes to order. 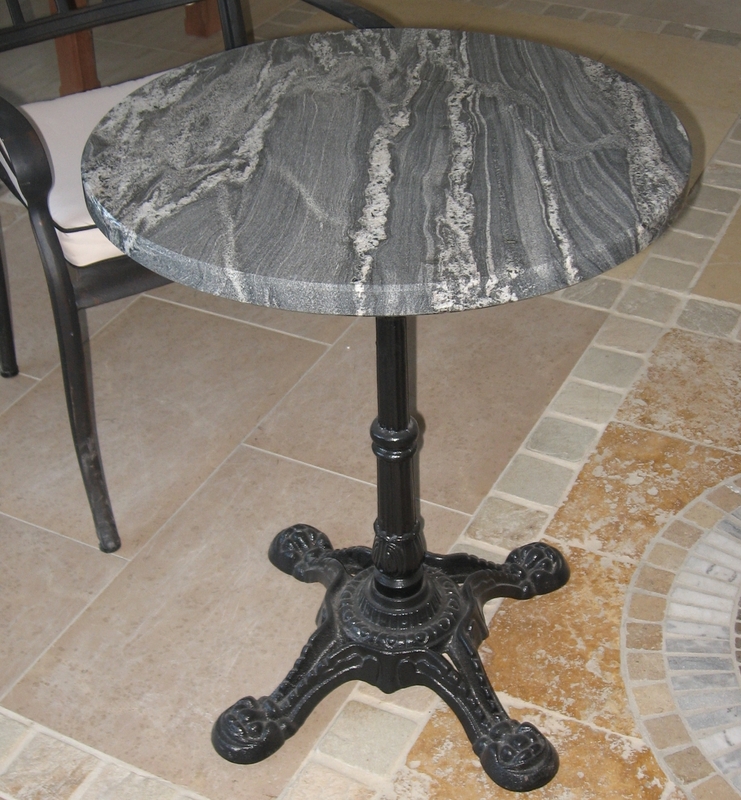 This beautiful 1200mm table is made from black slate and inlaid with marble to create a unique work of art. This is only suitable for indoor use unless covered during cold/wet weather. 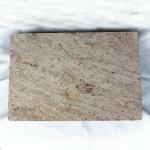 Shivakashi is an Indian creamy coloured granite with light grey and pink shading and the occasional black speckle. 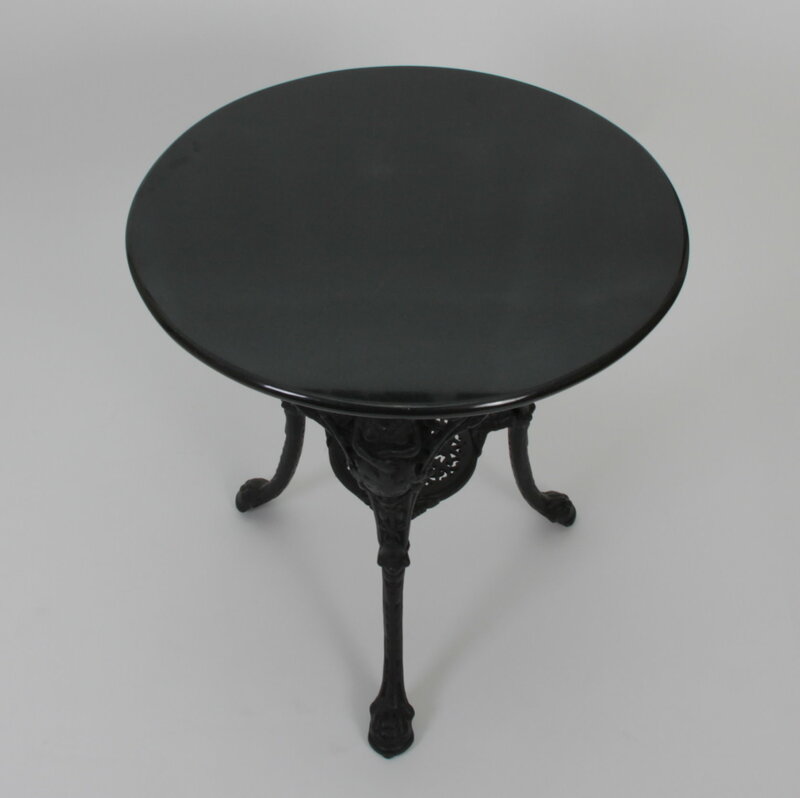 This table has been finished with an Ogee edge detail and comes complete with an antique pedestal base. Brown Pearl is suitable for inside or outside use. 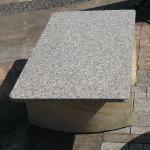 We have the granite in stock to make more 20mm or 30mm tops to any size, but the table top illustrated has been sold. A dark speckled green granite circular table top. Suitable for inside or outside use. Perfect garden table. 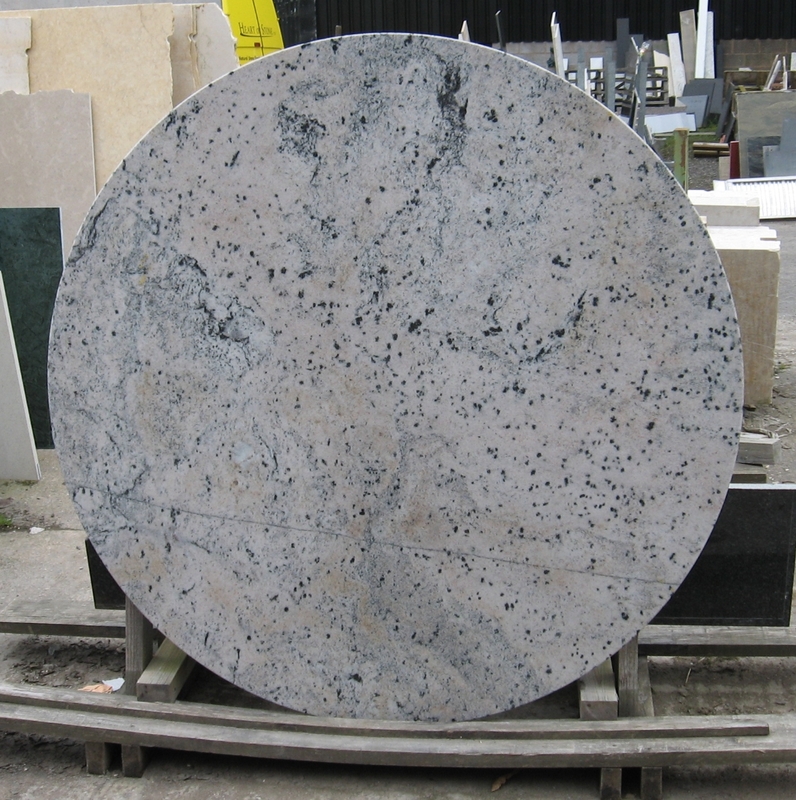 We have material in stock to make tables of up to 650 mm diameter, or a bigger rectangle. 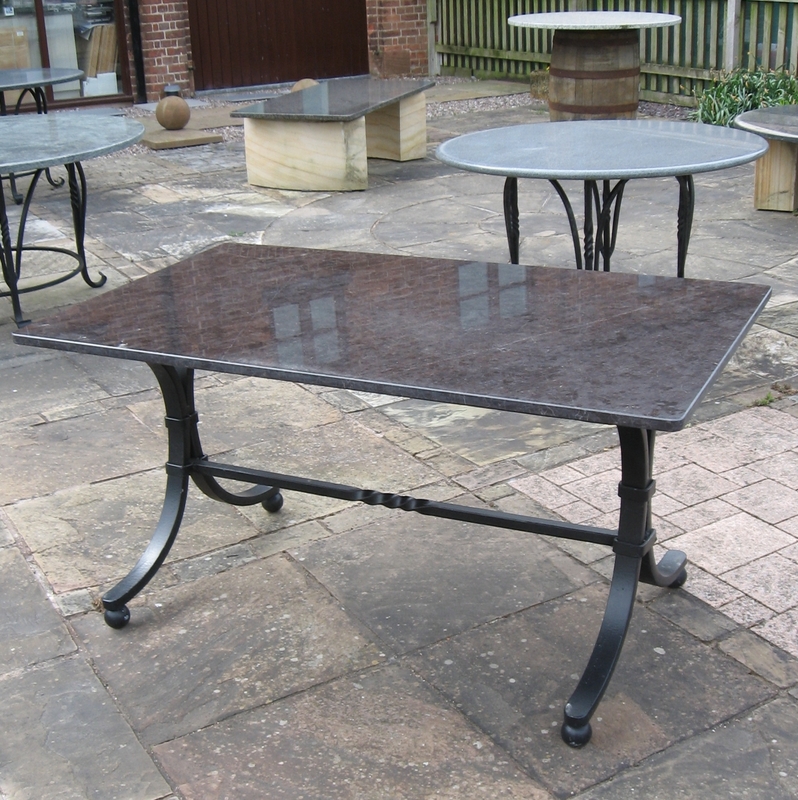 We have one Namibian Green granite table remaining, which is on display at Ironbridge Antiques, Arts and Crafts Centre. 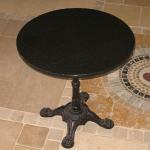 The table top is mounted on an Ornate cast iron pedestal base. 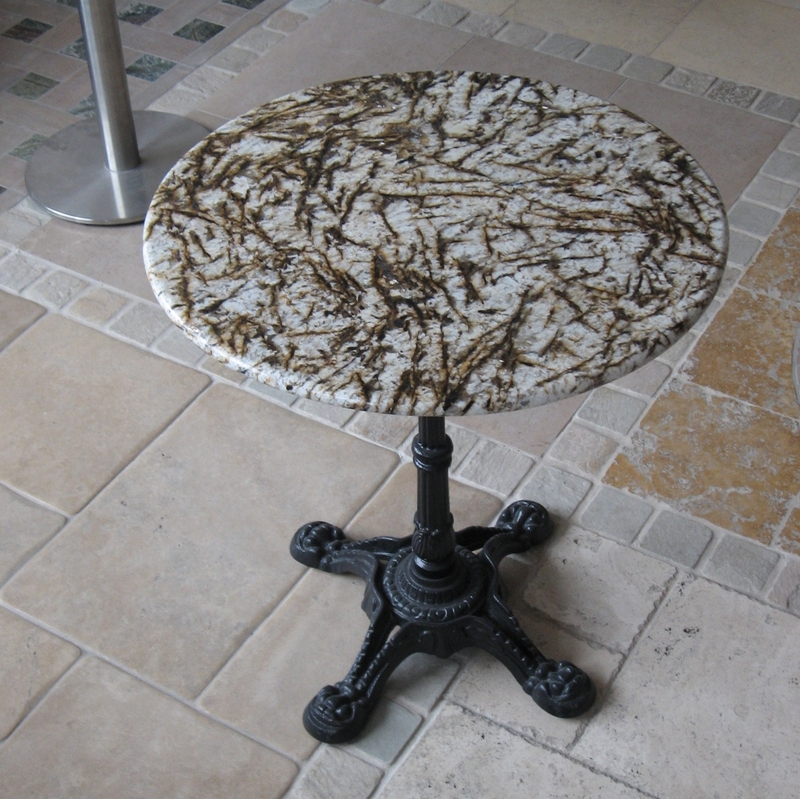 Breccia limestone is suitable for inside use only unless covered during inclement weather. 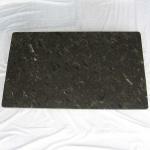 This small Breccia table top has a bull nosed edge and would make a lovely and uniquely figured coffee or side table. A stunning table top from an unusual material, with shades of peach, yellow and brown. This table top has an ogee edge profile. One only this size in stock. Other sizes can be made, subject to availability of the material. 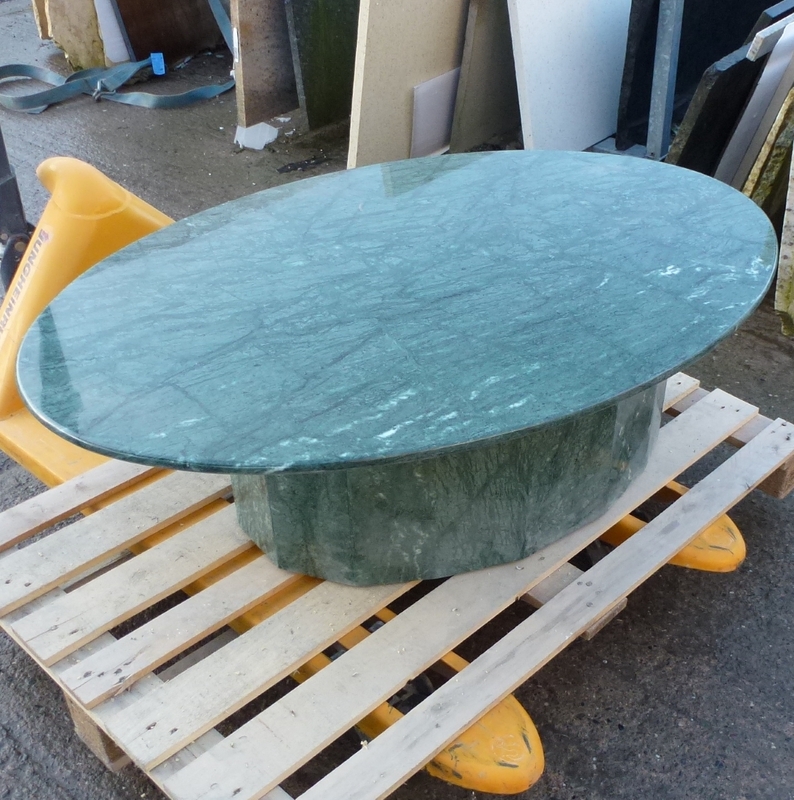 We have a one off 1400mm diameter Tropical Green granite table top. It is 30mm thick and has a pencil round edge. Please ring to check availability of material for other sizes. 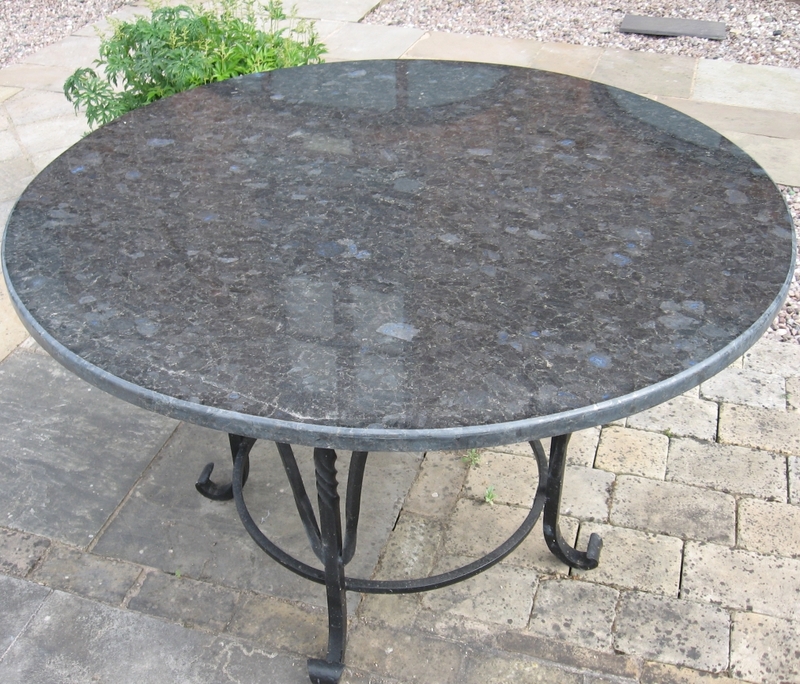 This beautiful and warm granite is gold with grey veins running through and makes a stunning table top. Can be used inside or outside. 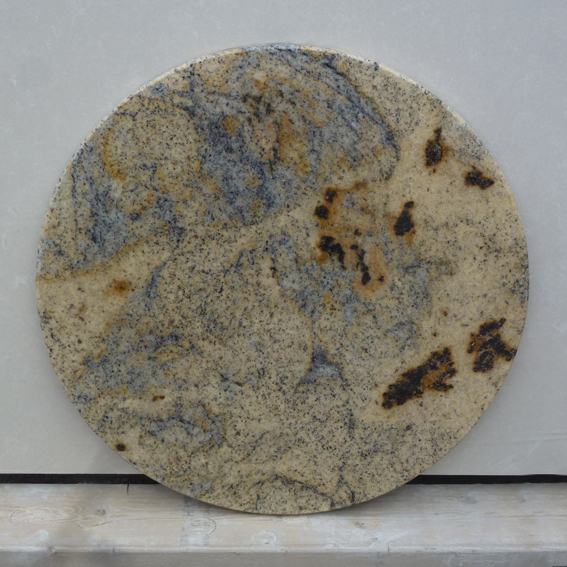 A perfect complementary table top to Kashmir Gold worktops. We have 3 tops in stock but other sizes can be made to order. None currently in stock, but please ring for availability of material and price. 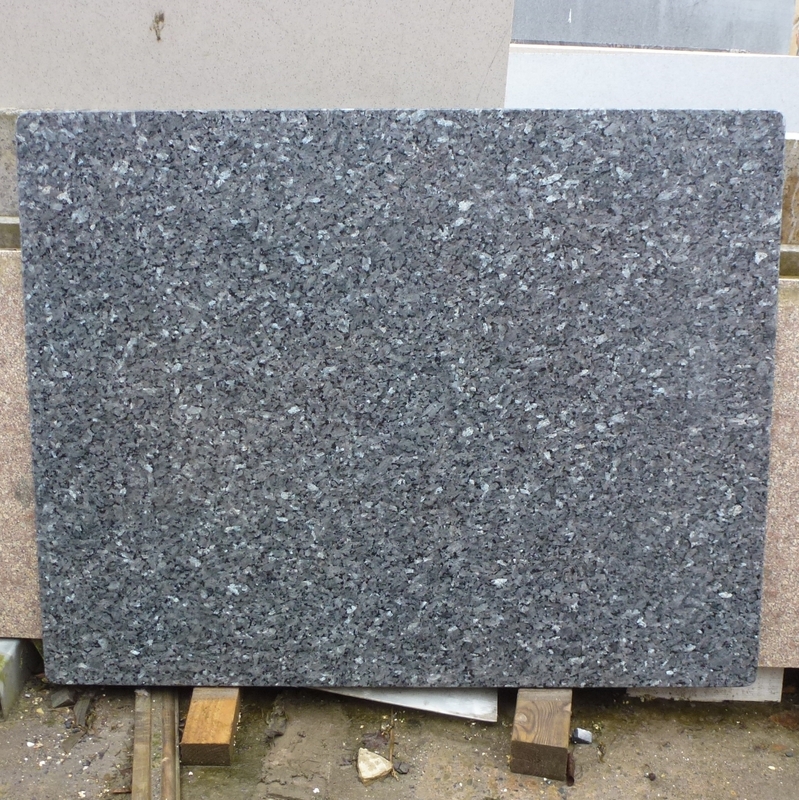 Butterfly blue granite has a greyish-brown basetone, with a scattering of reflective blue crystals throughout. 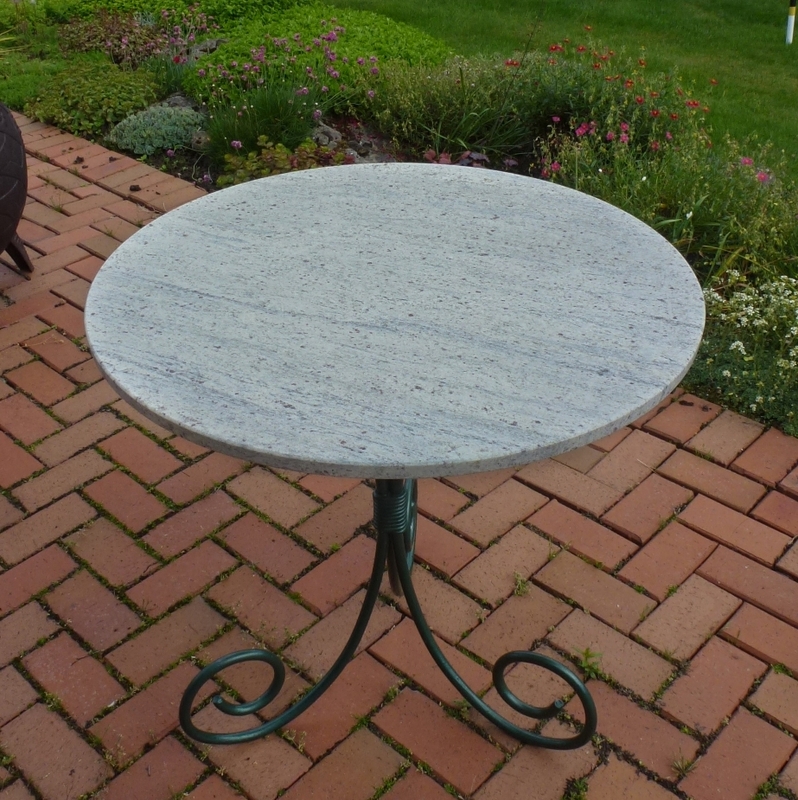 We have some imported round table tops with bullnosed edge. 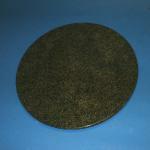 There are 700mm & 900mm diameter tops in stock, but we can make other sizes and shapes to order. 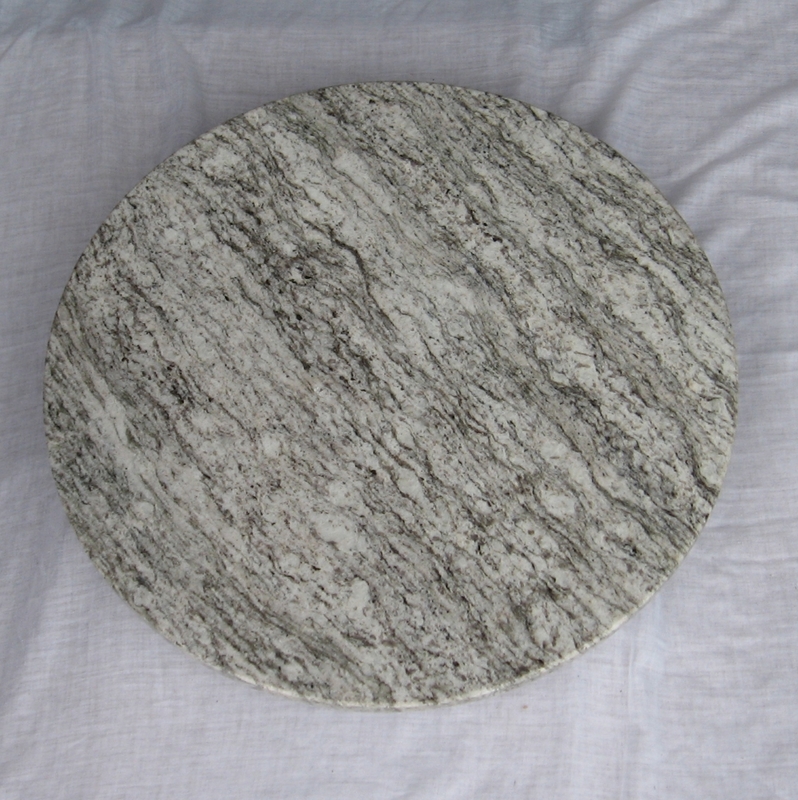 We have a several skintouch finish Kashmir White granite circular table tops with bevelled edge. We have a little of this material to make more, but it is not generally available until the quarries re-open. 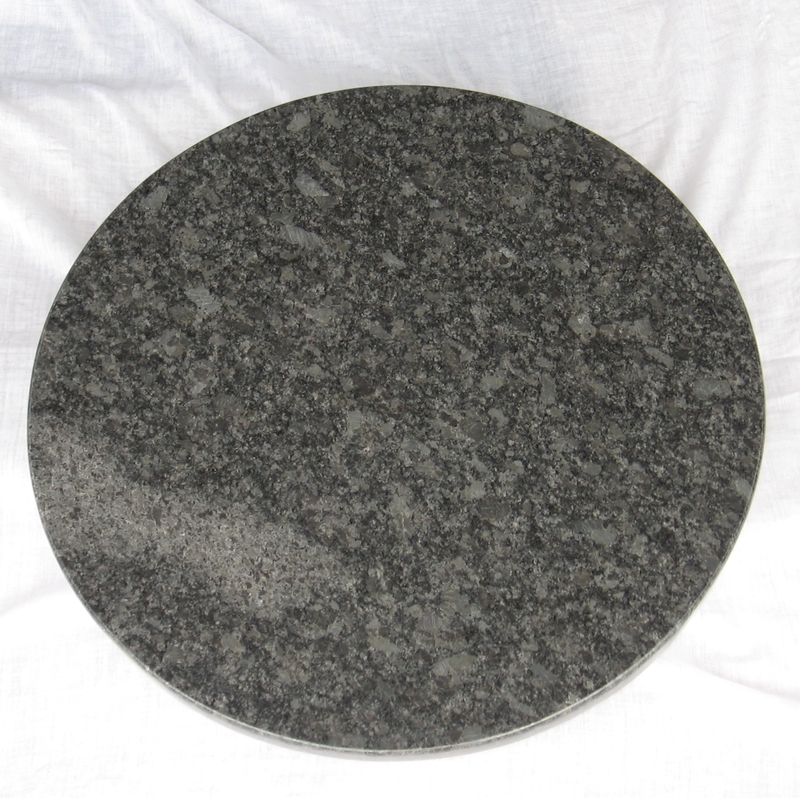 We have several Padang Grey Granite table tops in stock but other sizes and shapes can be made to order. These stock tops are currently available at a very competitive price. 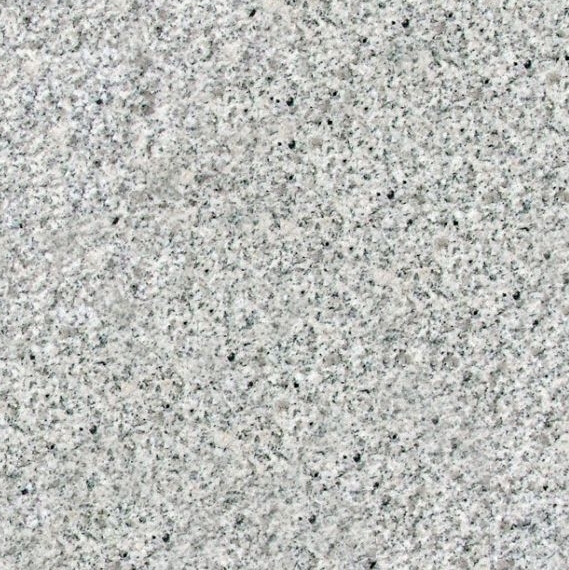 Silver Sea Green is a close-grained light green granite suitable for inside and out. 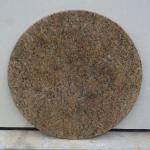 We have a few tops in stock and have some more 20mm thick material to make tops up to 650mm diameter. The table in the picture is an ideal size to use as a laptop or side table. Base included. One table in stock. A Madura Gold octagonal top and matching base. Seats 8. 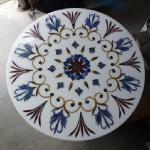 This table has been sold, but other sizes and other materials can be made to order. We manufacture bespoke table tops. 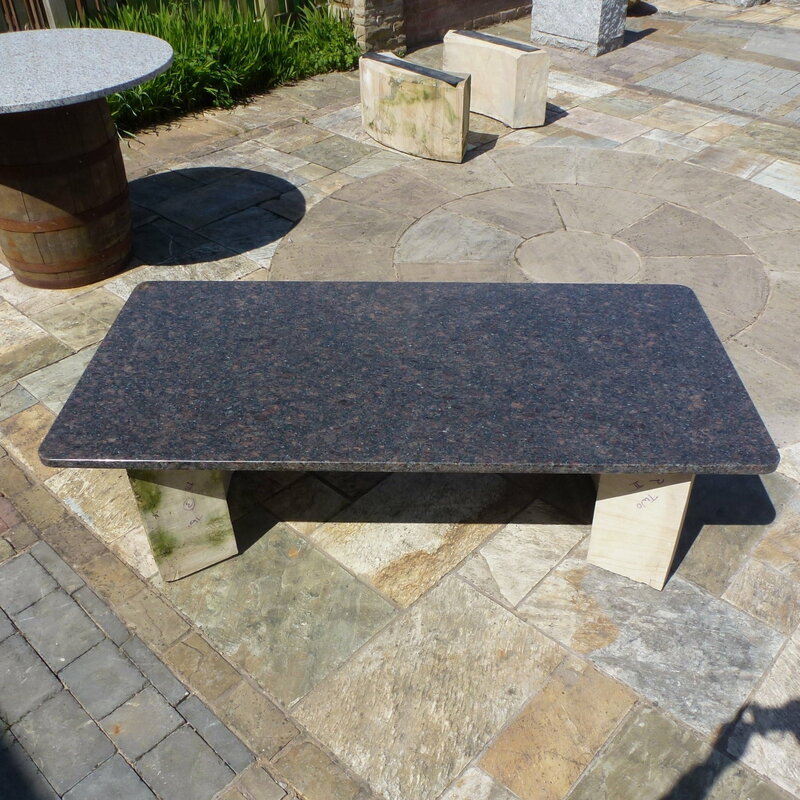 The Indian Multicolour Red granite top shown in the picture was supplied with a powder coated cast aluminium base. The edge detail was ogee. Price is based on material, shape, size and edge detail. Other sizes and materials by quotation. Other edge details available. A vibrant gold, brown and black granite table top with a bevelled edge. A stunning material. The edge detail is a full bullnose. This material is only suited to indoor use. A Madura Gold granite top 800mm in diameter on a traditional cast iron base. The edge is ogee. This garden table will seat 4 people. 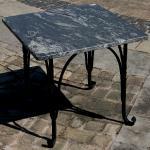 This table has been sold but we have material in stock to make more. 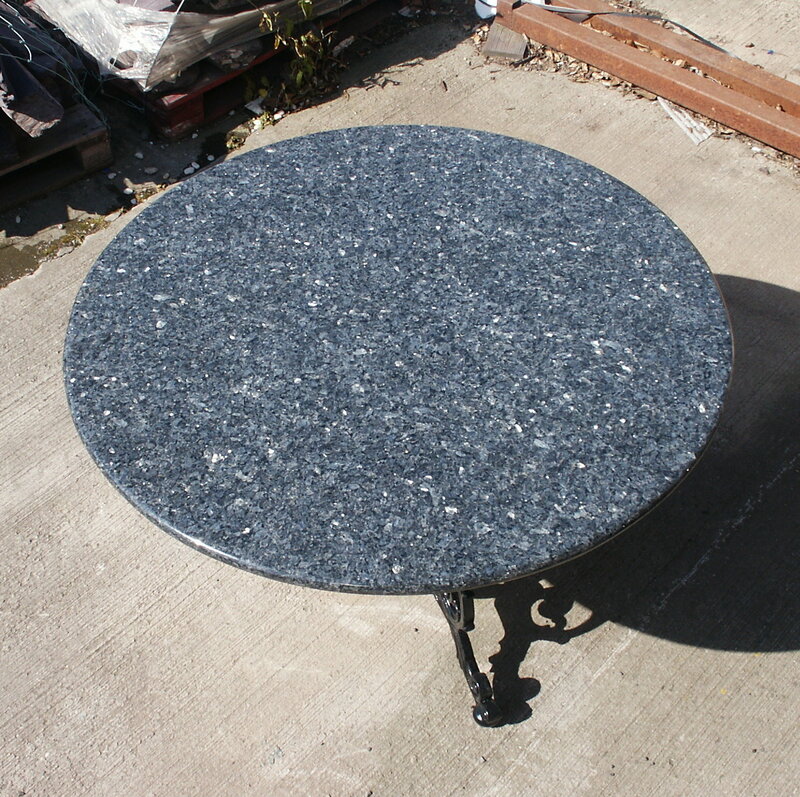 This photo illustrates the stunning appearance of Blue Pearl granite. The larger top of 1200x940x20mm will sit 6 to 8 people. The smaller top of 550x550x30mm is intended as a coffee table. We have the material to make other sizes to order. 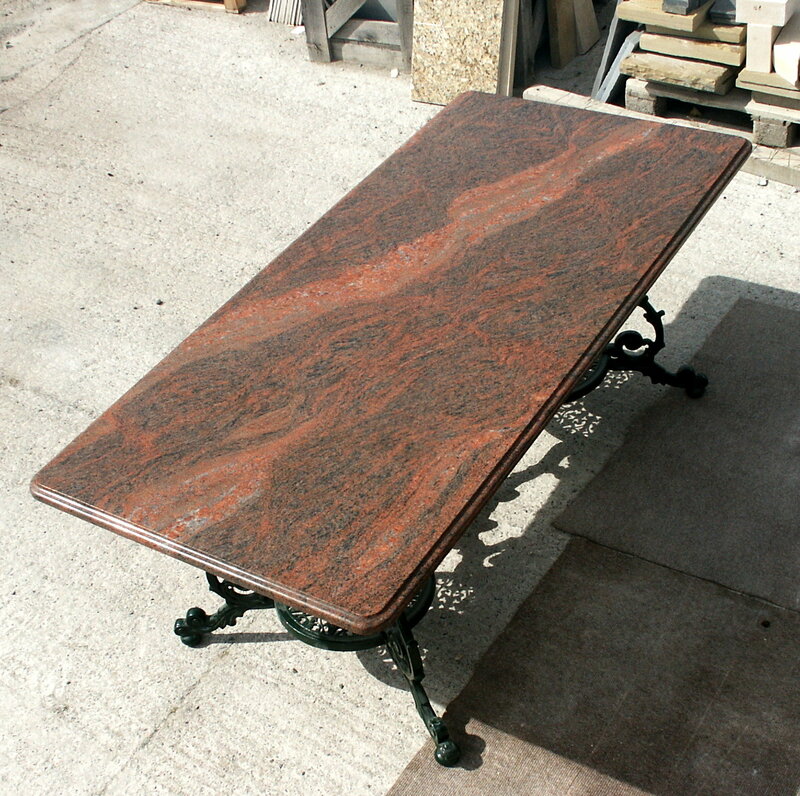 A table top from a very spectacular piece of Celestial Brown granite. 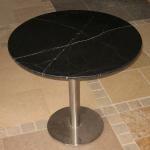 The table top is made from 20mm thick material with rounded corners and the edges are bevelled. 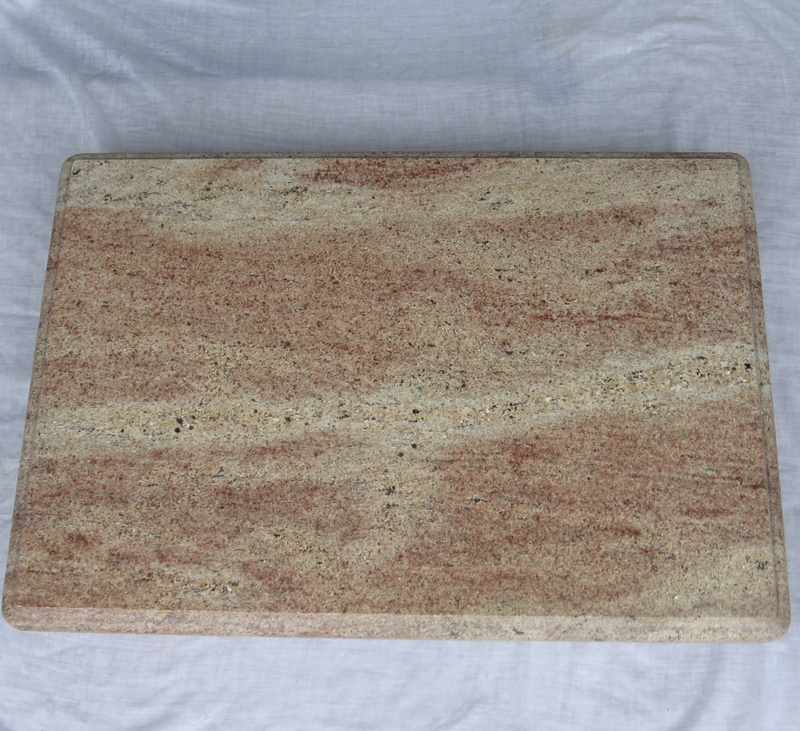 The image is of the 650mm x 650mm x 20mm top recently made for stock. 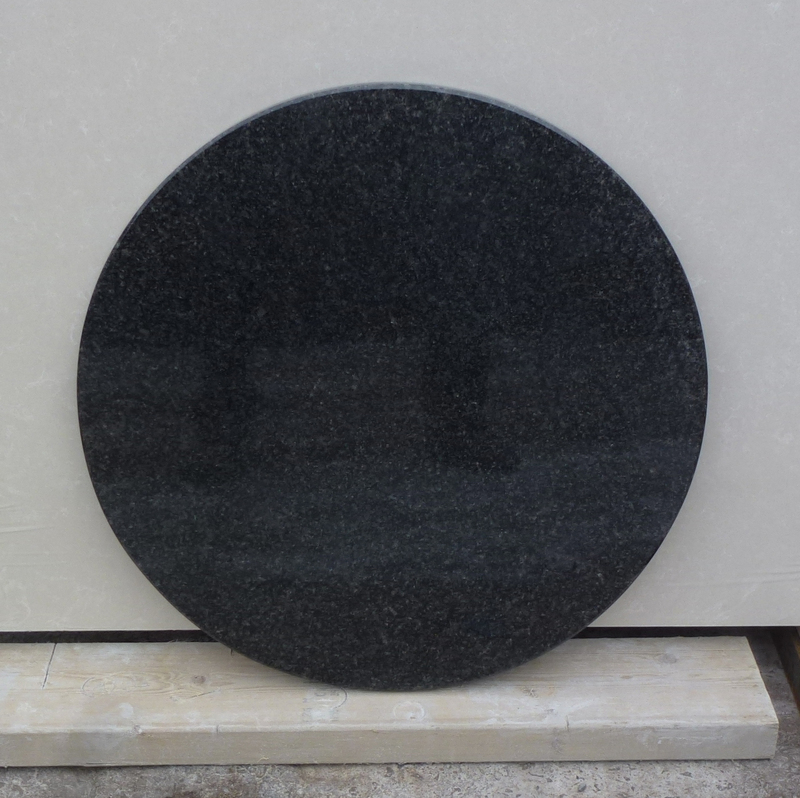 We also have a 600mm square top in stock and a 900mm square top in skintouch finish. No more material is available. 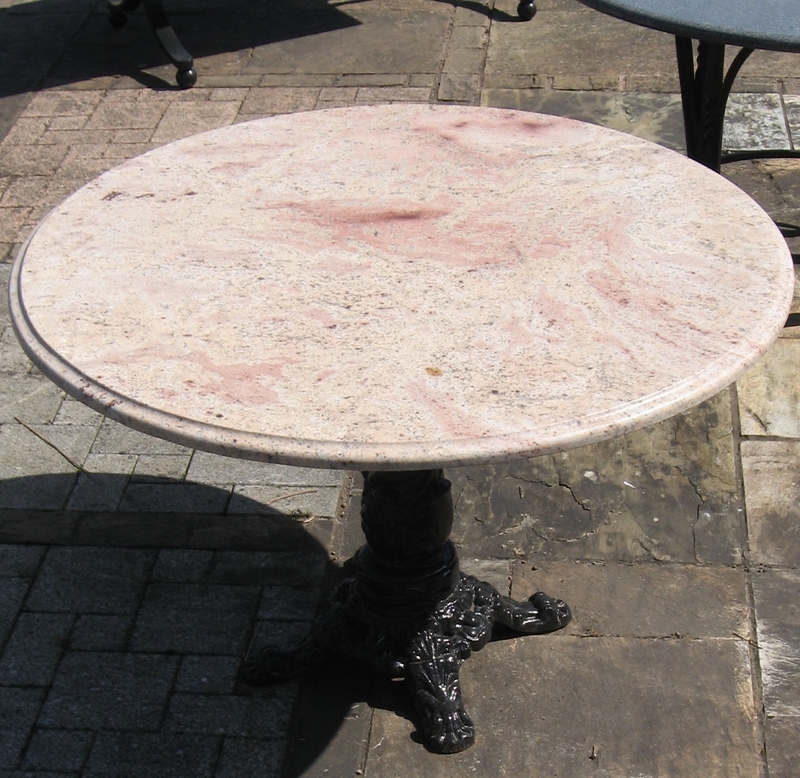 A Crystal White marble table top finely inlaid in a floral pattern. The inlay has Lapis Lazuli, red, green and gold coloured marbles. 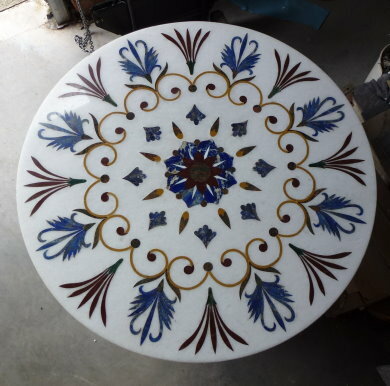 The table has been made using traditional methods as used in the Taj Mahal. This a one off. We can have others made to order. Suitable for indoor use only, unless covered over in the winter. 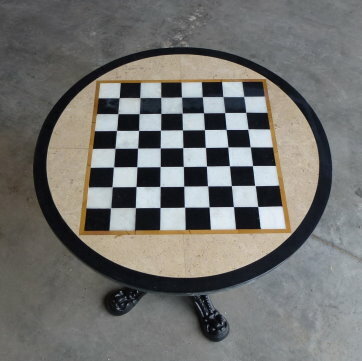 This 700mm diameter marble and granite chess board design table top is hand made. The materials used are black granite, white, gold and oatmeal coloured marbles. A base can be supplied if required. This black and white chess board table top was made in our workshop from Turkish White marble and Nero Marquena. The inset border is Brazilian black slate. 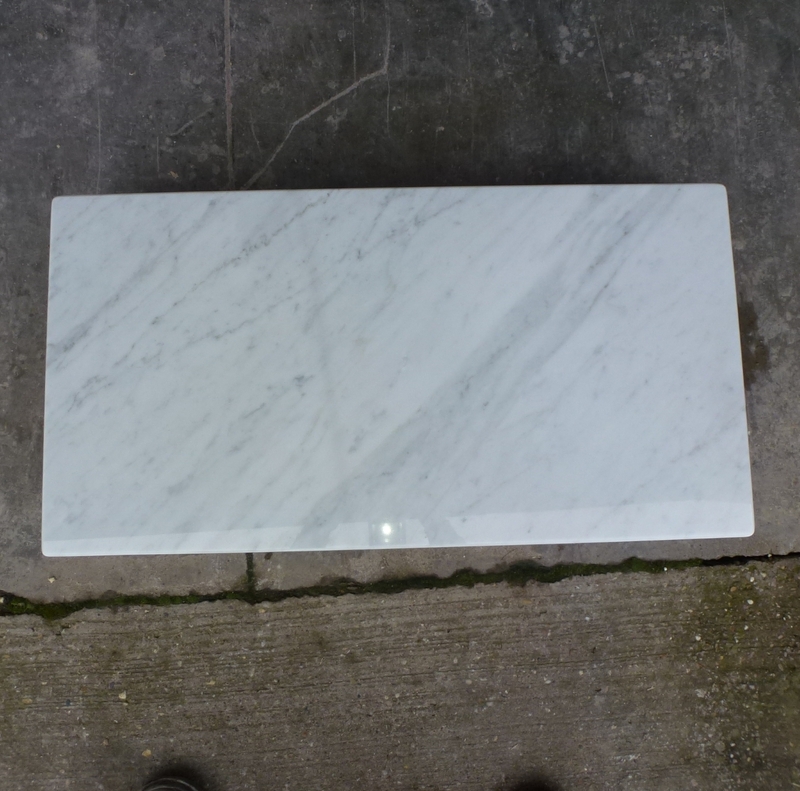 The white marble is 20mm thick and there is a 10mm slate base under the board. 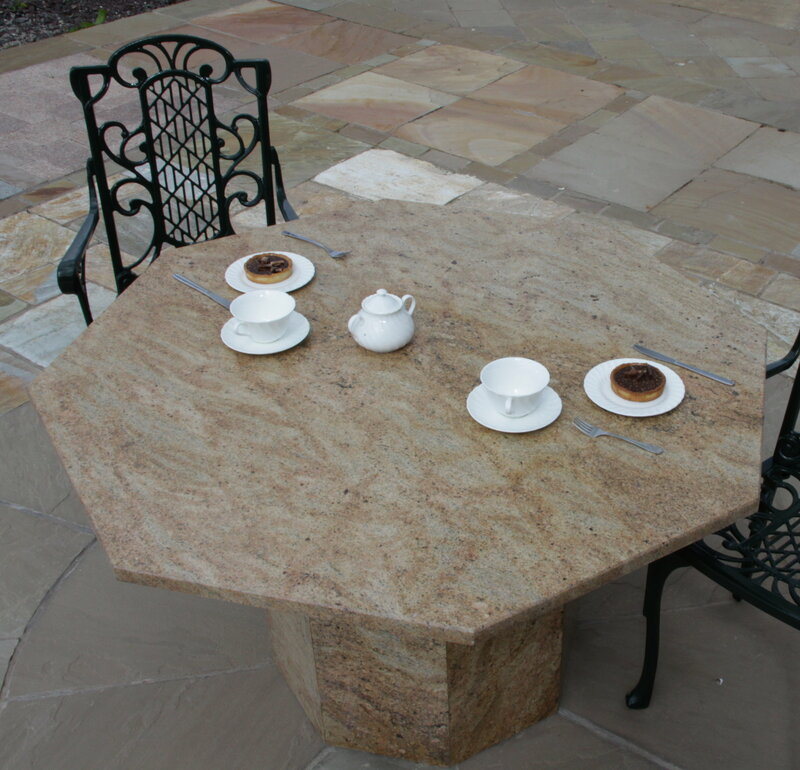 A light grey natural quartzite with a subtle figuring table top suitable for inside or outside use. We have two 800mm and two 600mm tops in 30mm thickness in stock. 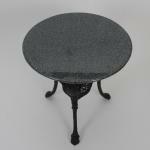 This top is made from a near black granite with a scattering of blue crystals. These crystals catch the light and have a distinctive pearlescent reflection. 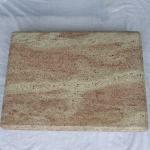 One table top in stock, but material available if other sizes are required. 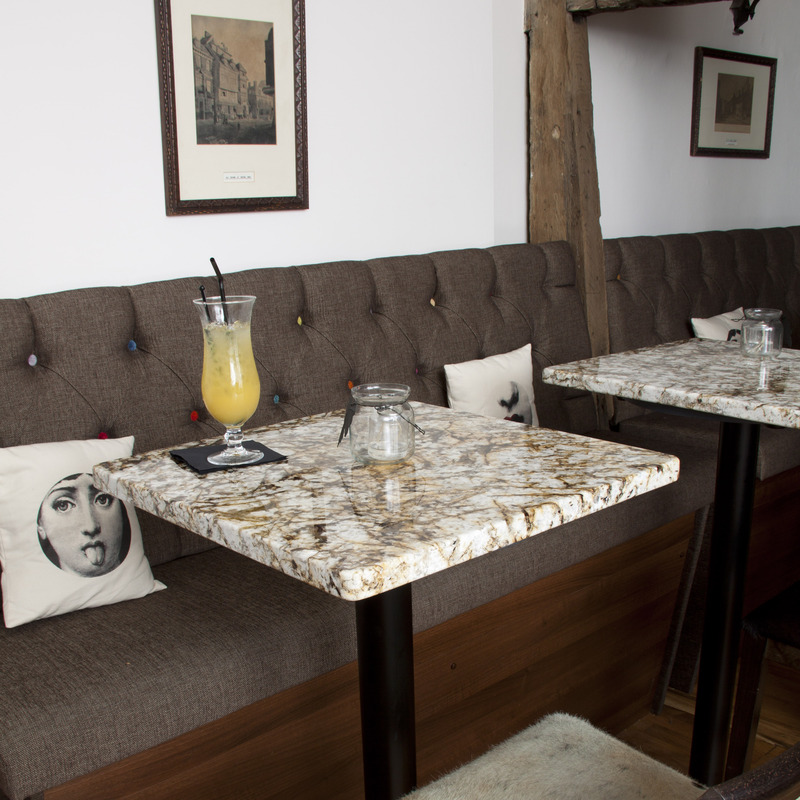 We manufacture bespoke table tops for restaurants and commercial premises. 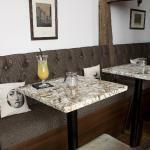 Those shown in the picture are White Frost granite to match the bar-tops that we also supplied and fitted at Drapers Hall restaurant in Shrewsbury. 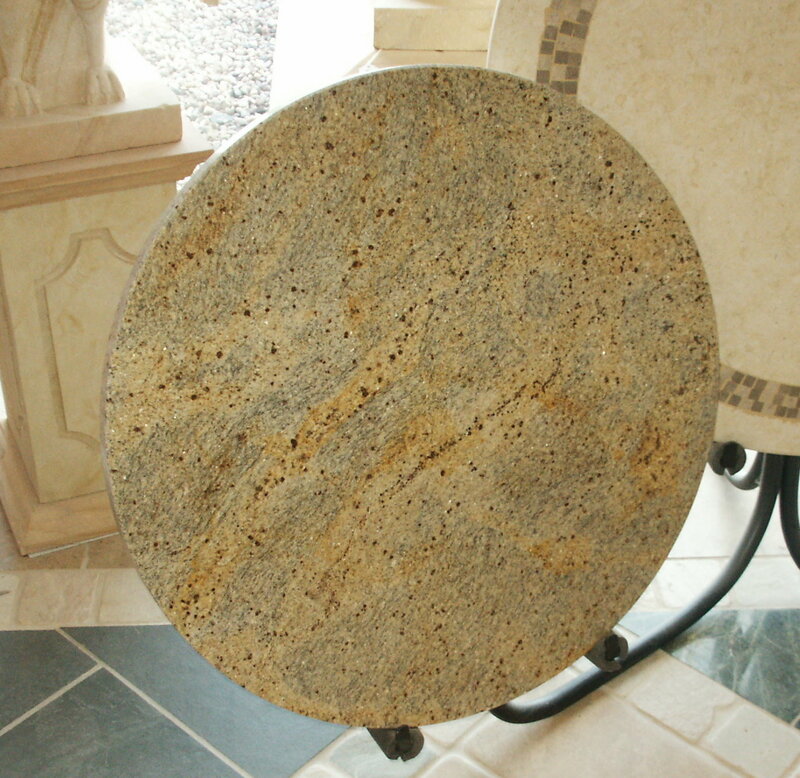 Ubatuba is a dark brown Brazilian granite which is extremely durable and can take a high polish. But, even though it appears to be a consistent dark colour, it is speckled with greenish yellow minerals when viewed up close. 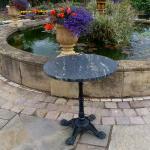 We have a number of tabletops of differing sizes and shapes in stock. The tabletop illustrated will comfortably seat 6 people. A small square table top that will comfortably seat two, or four for snacks and teas. Silver Paradisio is Black granite with silver veins, with a hint of peach. Please ring for availability. We have one 750mm square and one 700mm diameter round top in stock. 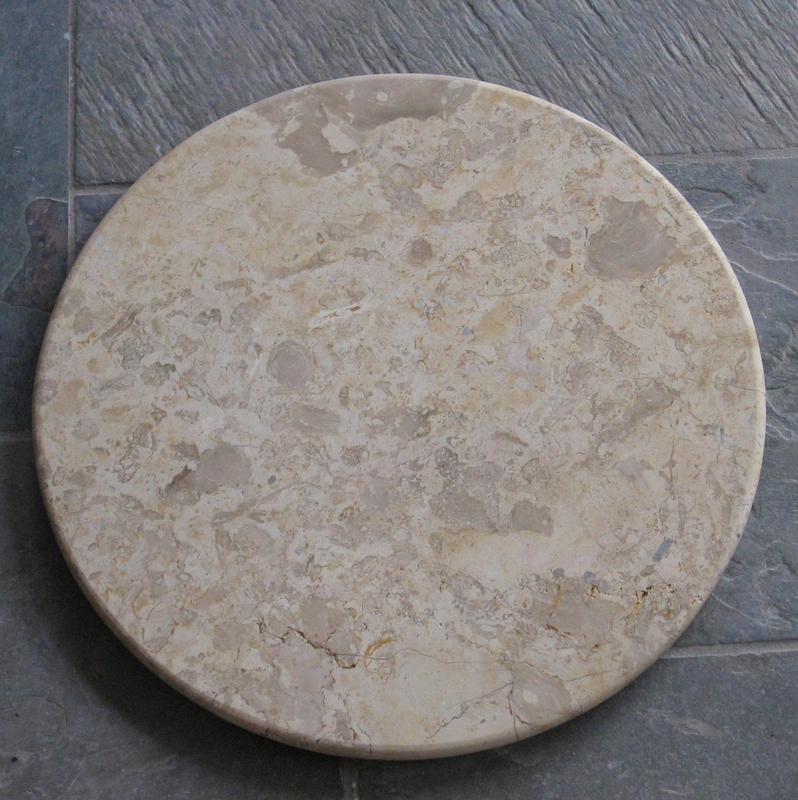 Valley White is a similar colour to Kashmir White, but slightly richer and the veins are more defined. This top was made to order and has been sold but more can be made if required. It is 30mm thick with a bevelled edge. Paradisio Bash is highly textured material, with shades of grey, black and red swirling around each other. This material looks stunning and has been extremely popular, so please ring to check availability. 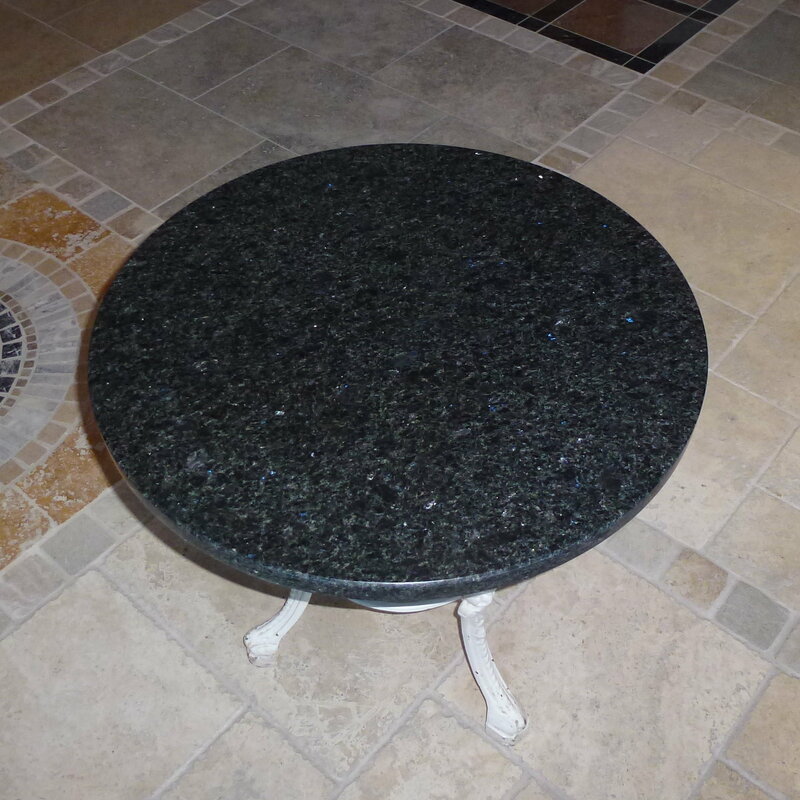 Star Galaxy is a very resilient and eye-catching black granite, with tiny golden crystals which catch the light. 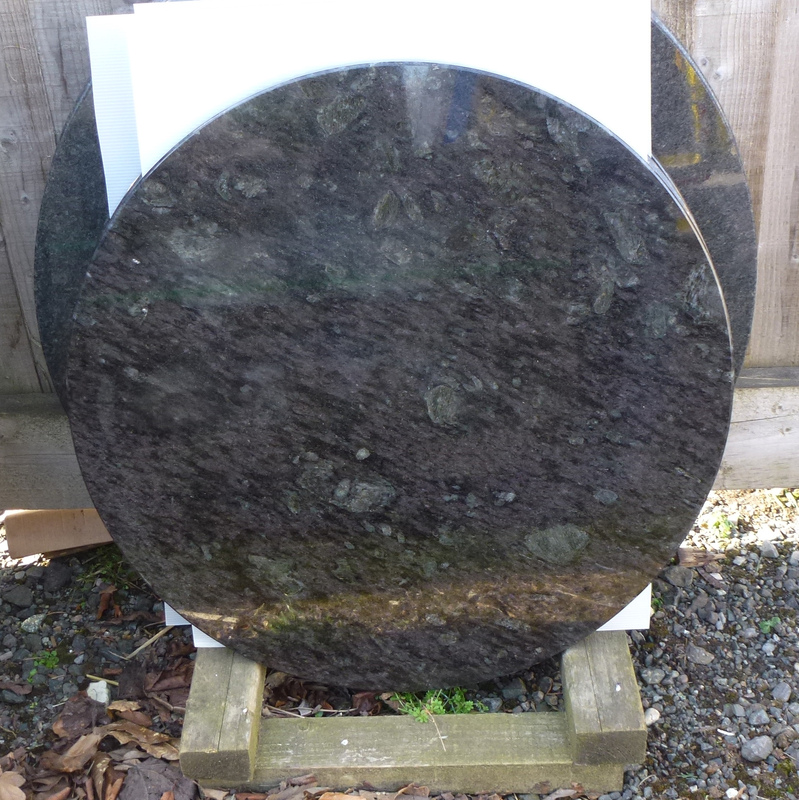 The picture is of a 800mm top on a period base, which has now been sold, but we have stock of imported 700mm diameter, 20mm thick tops.These have a bullnosed edge. We can make other sizes to order. 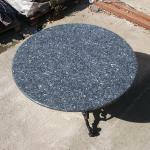 We have a limited stock of 30mm polished Azul Platino table tops at a very competitive price. We have some ready made with a straight edge with bevelled top and bottom. We can make more at these prices until stock runs out. These tops are suitable for inside or outside use. 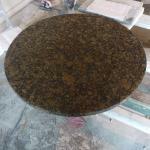 Baltic Brown table tops. We have some sizes in stock. More can be made to order at any size. These can be used inside or outside. 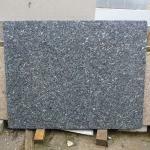 Alexander Black Granite is a black granite with dark grey speckles. We have some tops made for stock, but other sizes can be made to order. 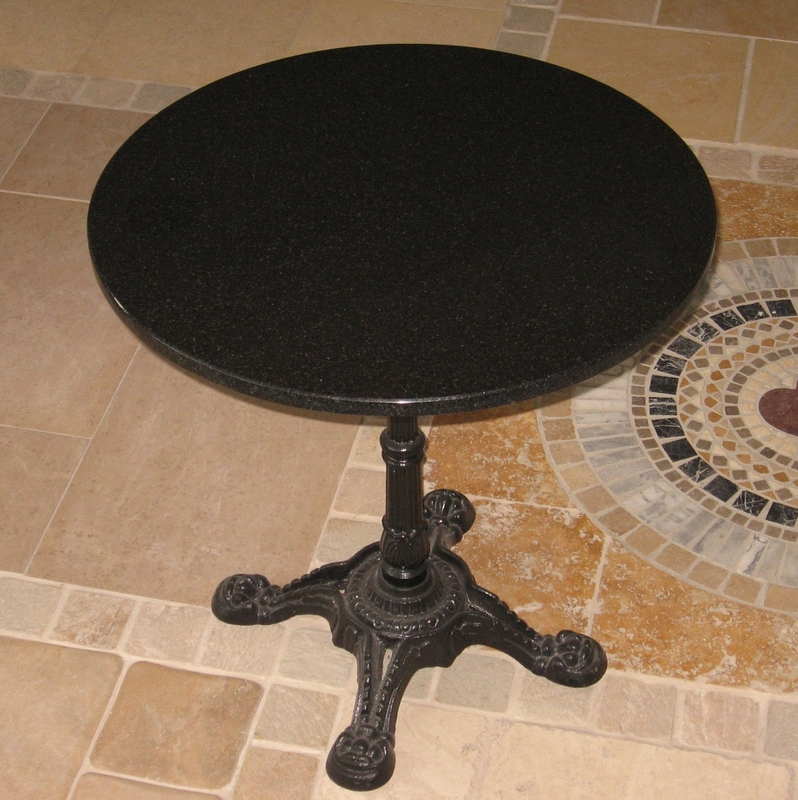 This table top is displayed mounted on a traditional cast iron single pedestal base. A table top made from Silver Forest granite, which is a richly textured colour. This material can be used inside or outside. The table illustrated includes top and base in the price. We have material in stock so more tops can be made to order. 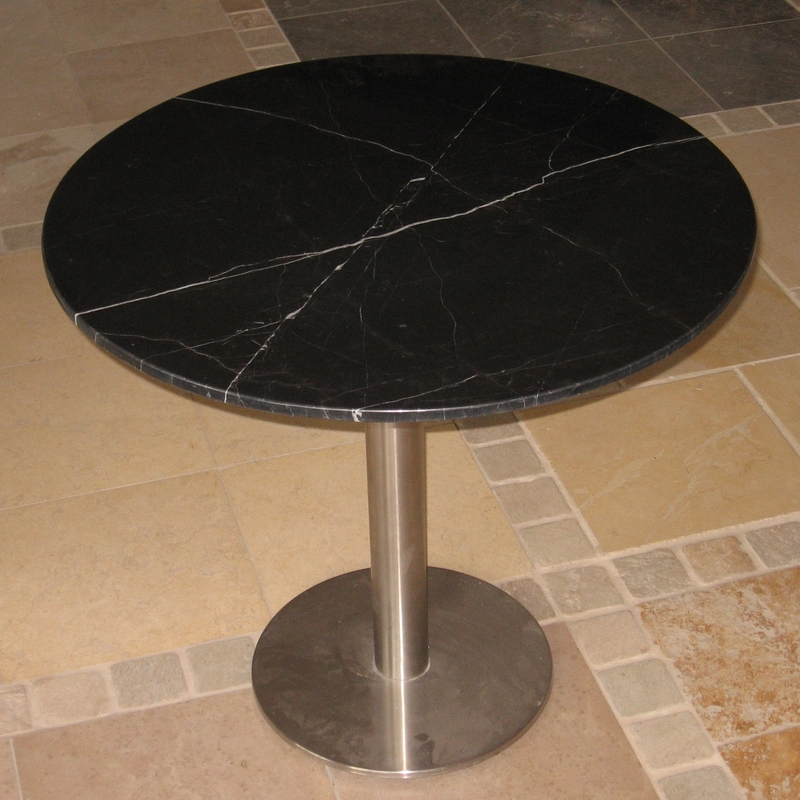 This stunning table top of 2000mm x 1000mm x 20mm will comfortably sit 8 people and is suitable for indoor use only. It is designed to sit within a stainless steel base as a dining table. Other sizes can be made to order if required. The table pictured is in stock and the price includes the base. 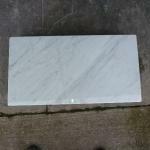 Carrara marble is suitable for indoor and outdoor use. 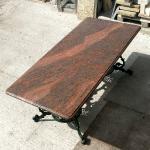 This table top would make a lovely coffee or side table. We have more material in stock if another piece is required to make a pair. 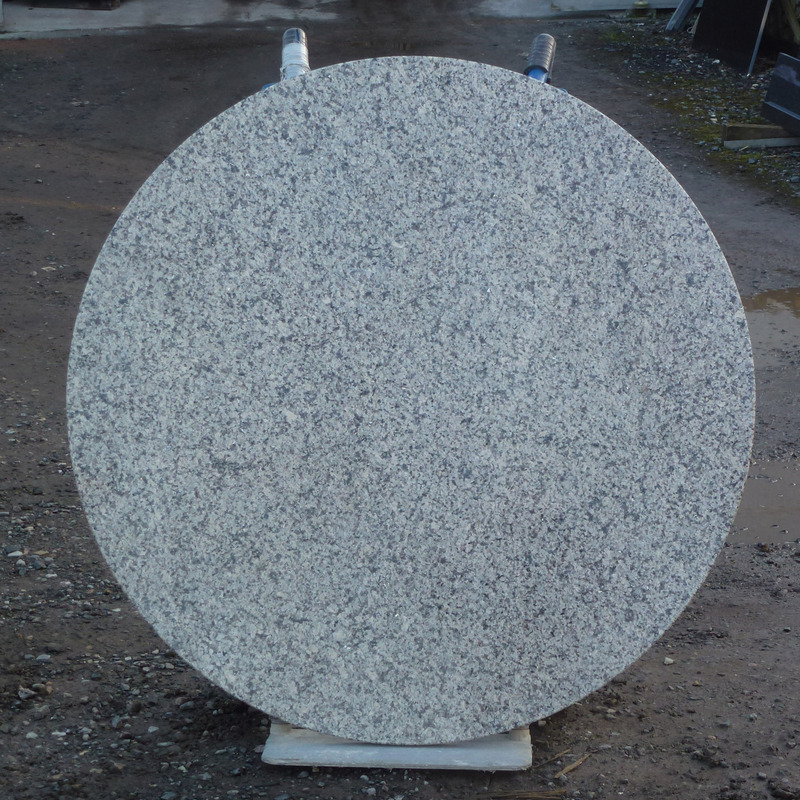 This is a striking Brazilian white granite with grey veining in an attractive pattern reminiscent of Carrara marble. The granite is suitable for inside and out. We have more material available if other sizes are required. 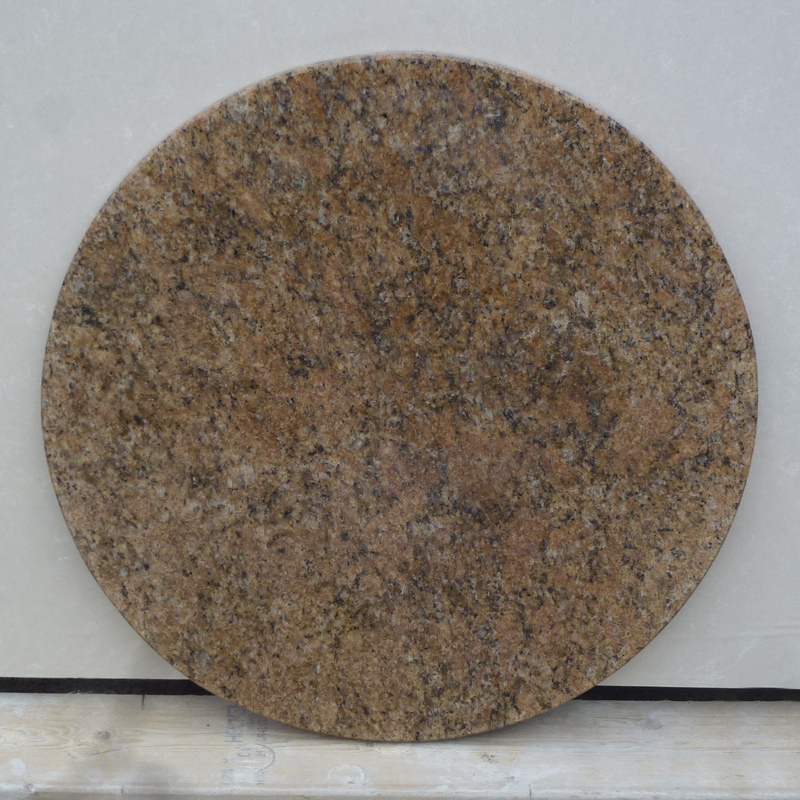 This Indian granite is a rich mottled dark brown and is suitable for use indoors and out. The table in the photo is for sale and will easily sit 6 people. We have material to make further tops to your size. 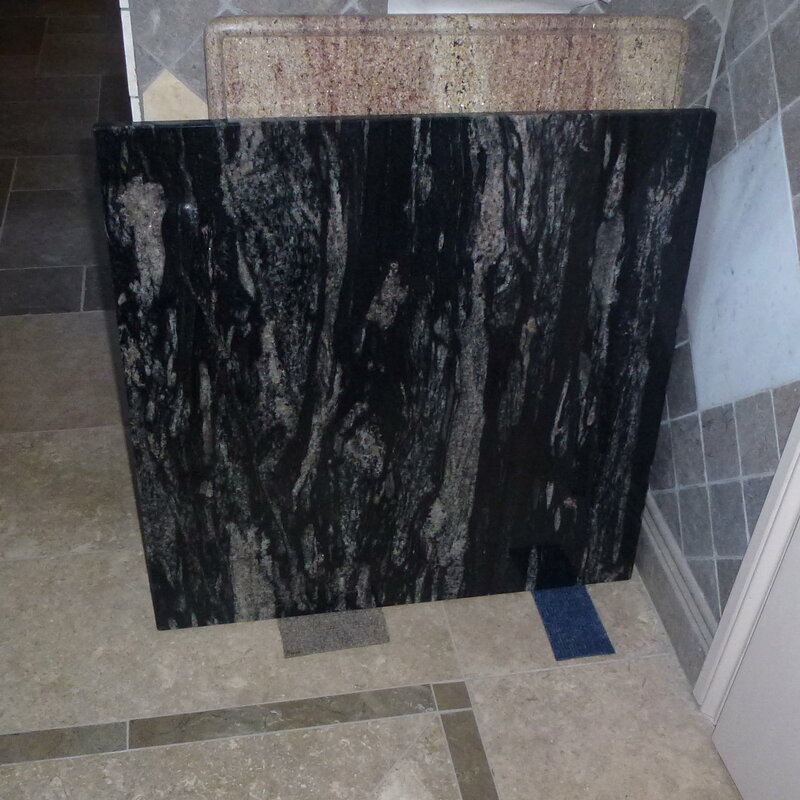 Cosmic Black is stunning marbled granite from Brazil. 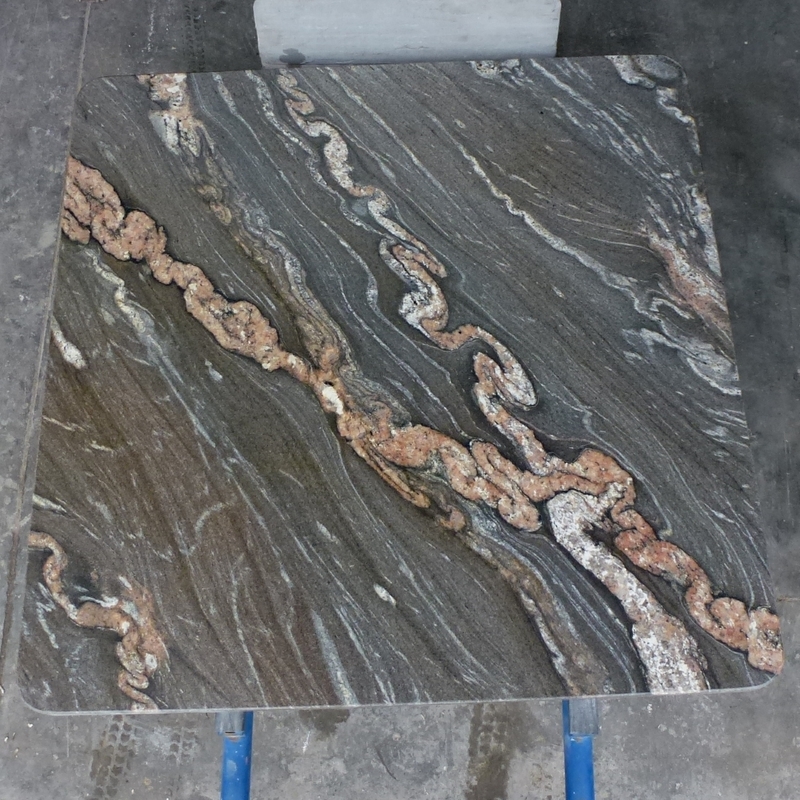 It has bands of quartz and mica with tiny red garnets which create white and copper-coloured swirls against the black background, as can be seen in the photo of our 900x900x30mm square table top. 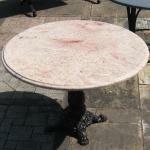 We have several table tops in stock, but if other sizes are required, please ring for availability of material. 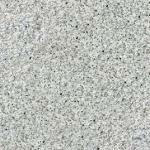 Galaxy Grey Granite is a light grey granite with scattered small to medium sized darker crystals and is an ideal granite for all internal and external use. 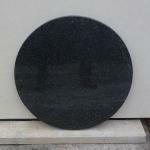 We currently have one 1200mm diameter table top in stock, but have the material to make other sizes if required. 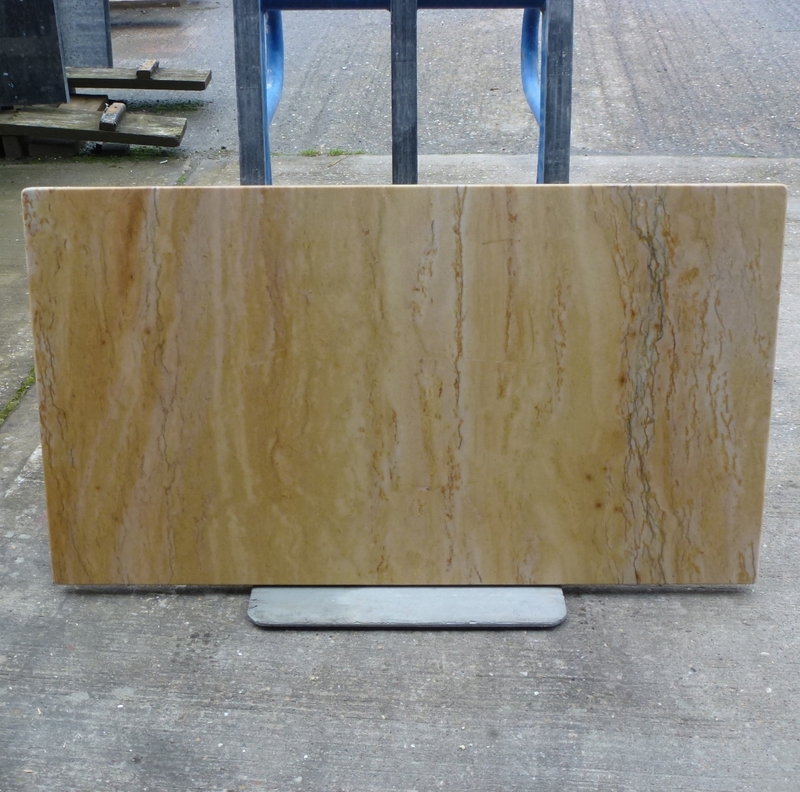 Golden Macaubas is a quartzite from Brazil with a lovely golden colour. It is suitable for indoors and out. We have a rectangular table top in stock at a discounted price - see photo, and a small amount of material remaining to make another slightly smaller. Please ring for more information. 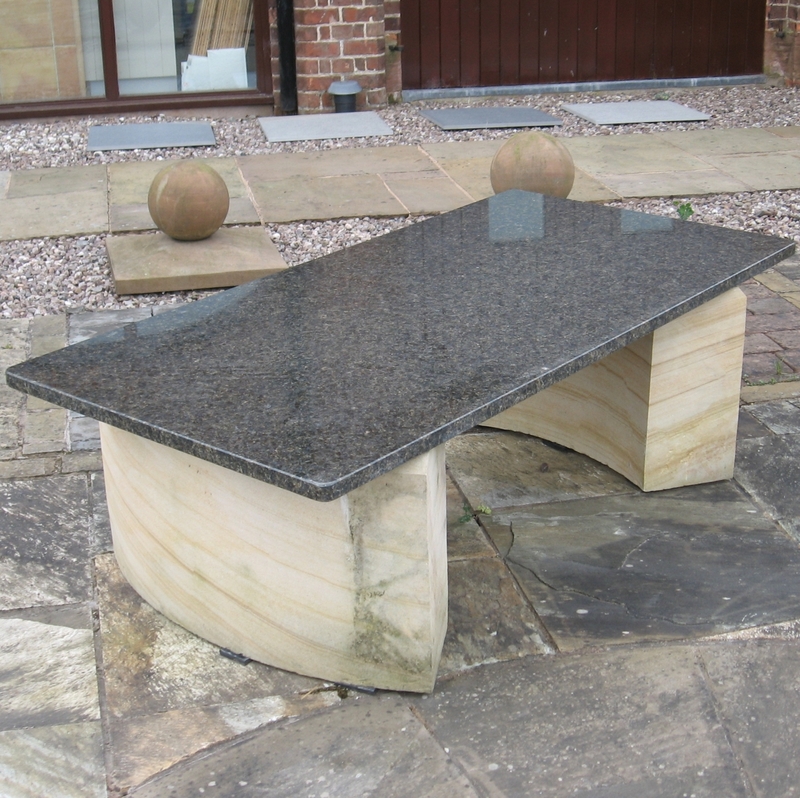 A Chinese granite suitable for indoors and out. The table in the photo will seat 6 to 8 people. We have a small amount of material remaining to make other sizes, but please ring for availability. 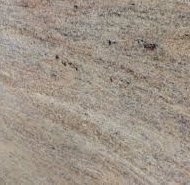 Nero Impala granite is quarried in South Africa and has a black backgound with light and dark grey swirls and flecks. It is suitable for both indoors and out. 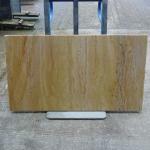 We have one 1200mm and one 600mm table tops in stock but material to make other sizes. 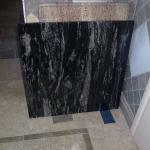 Nero Marquena is a stunning black marble from Spain with striking white veins. It is only suitable for indoor use. Please ring for availability of material if other sizes are required. 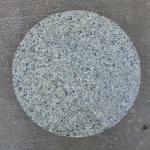 Shivakashi is an Indian creamy coloured granite with light grey and pink shading and the occasional black speckle. It is suitable for indoors and out. Please ring for availability of material if other sizes are required. This is a dark green and crystalline stone which makes a striking and unusual table top. It is suitable for use indoors and out. We also have more material to make other sizes. 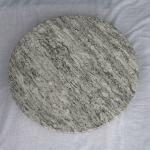 This is an Indian granite and is a primarily white stone with black flecks and waves of light and dark grey veining. It is suitable for use indoors and out. We currently have one large 1700mm diameter table which will comfortably seat 8 people, but have more material to make other sizes. 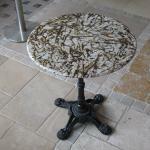 This beautiful table was made to order and is now sold. 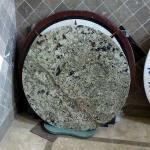 It consisted of an oval table top and matching base. Please ring for further availability and price. 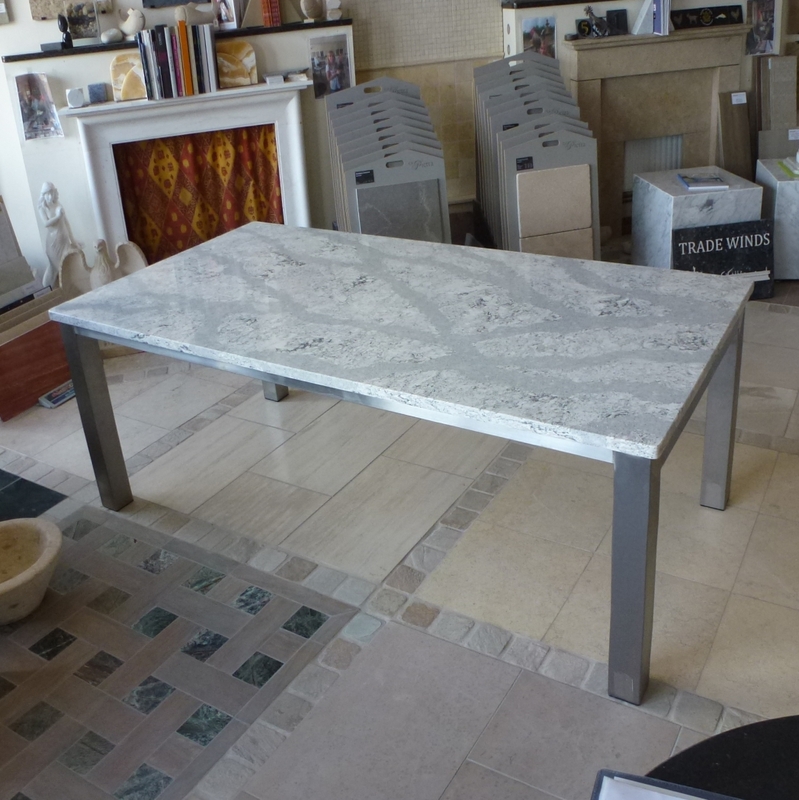 A one off rather stunning quartz table top available at a discounted price. Suitable for inside use. It can be used outside if protected from sunlight as quartz products break down in UV light. A well priced granite table top suitable for inside or outside use. 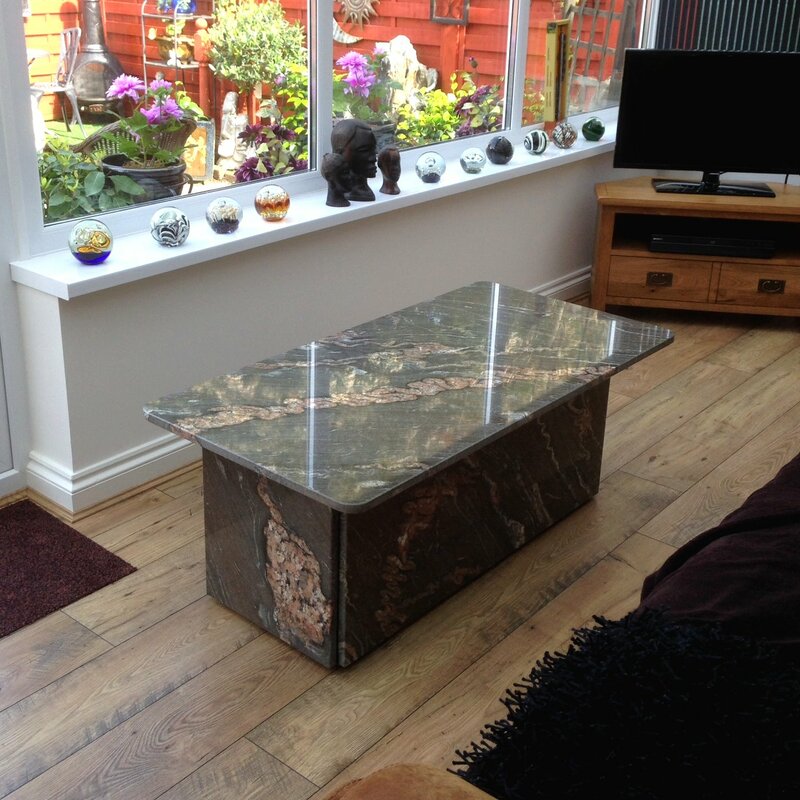 A dark granite with exotic crystal figuring. We currently have 3 of these in stock.